Recently I got in some nice 2758 EPROMs. 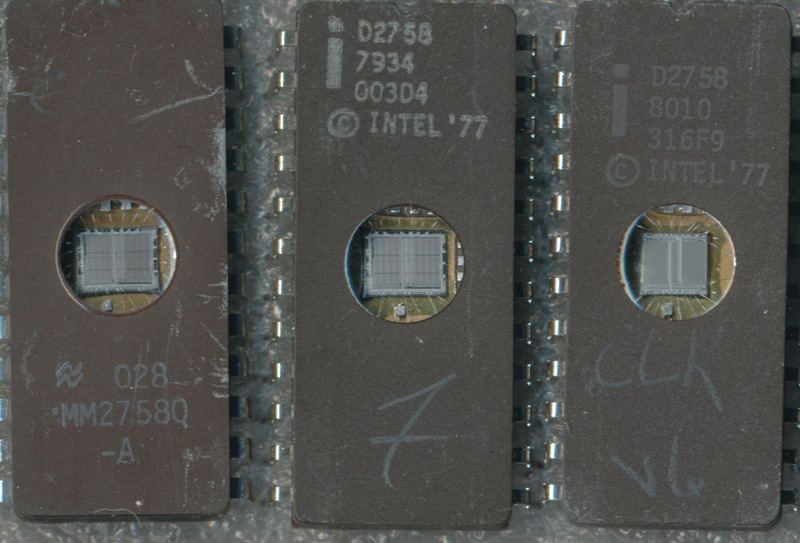 The 2758 was a 5V 8k EPROM and really the first of the standard EPROMs (with industry standard pinouts, voltages, etc). The original 2708 required 3 supplies (5V, -5V and 12V) while the 2758 required only +5VDC. 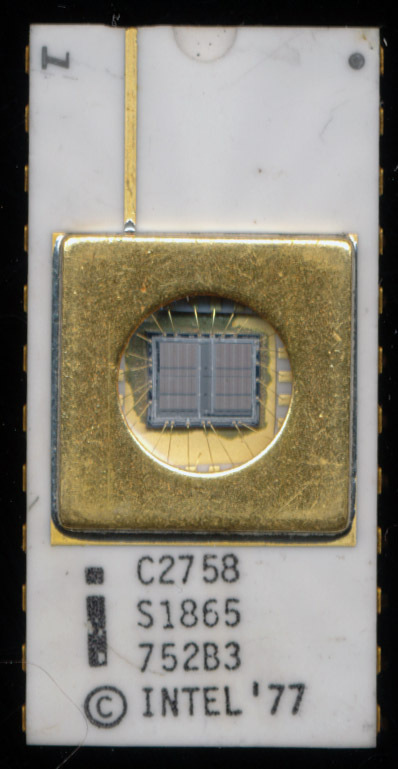 EPROMs are particularly nice as due to the fact that they need a window to allow UV light in for erasure, you can also have a clear shot of the die (in most cases). Two things caught my eye on these 3 EPROM’s. 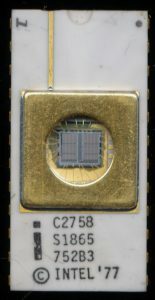 First, the National Semiconductor 2758 die looked suspiciously like the Intel die. This isn’t too unusual as National was one of Intel’s primary second sources throughout the 1970’s. Intel did not have the best fab’s early on so second sourcing was a must. As a product of this some strange things happened, such as Intel die’s being in National labeled parts (though the reverse is not known to have happened). The second thing you can see in the picture is the difference in die structure between the otherwise seemingly same Intel 2758’s. One has bonding wires on all 4 sides, while the second one has bonding wires only on the top and bottom of the die, and a completely different layout to the die. My first suspicion was that the Intel and National may both be the same die, so I put them on my scanner (I REALLY need a microscope). At 4800dpi (or 9600dpi on one) you can see that they are in fact different dies, and both are not 2758 dies…. Both are actual 2716 dies! We saw this several years ago with 2708s being used as 2704’s as well as in Soviet designs. The third die is a 2716 die as well. All Intel (and National) did was leave one address line unused (tied to ground in this case). Its likely these dies had a defect so the affected area was effectively disabled by not using that address line. as well as increasing density). The 2716 was released BEFORE the 2758, the 2758 being almost an afterthought, it is very likely that ALL 2758 dies are actually 2716 dies, as it would make little sense for Intel to create a separate mask set for a product that was likely to be low volume. The 2758 data sheet lists pin 19 as AR (Address reference) and specifies it to be driven low, or for the S1865 driven high. Pin 19 on a 2716 is A10 so AR on the 2758 is simply selecting the lower 8k or for the S1865 the upper 8k. 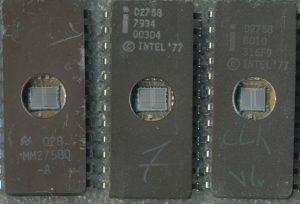 Being as there was 2 versions of the 2758 using different parts of the die, its clear Intel was using defective 2716 die to make the 2758, at least early on. Later documentation simply has Pin 19 listed as GND. As a side note, the CPU Shack REALLY needs a microscope, sorry for the blurry photos from the scanner.